If you’re a petrolhead like me, then at some point in life you’ve driven past some clapped-out heap at the side of the road and dreamed of turning it into the most badass car on the planet. I’ve been there. Now that dream is real. Full Disclosure: This is a story about building a race car for the Broadmoor Pikes Peak Hill Climb. Some, if not all, of the companies involved have sponsored this build in some way, shape or form. Without their support this build would not be possible and therefore there would be no story. If you do not want to be exposed to these companies and think that somehow, in some way, sponsorship is bad, then please do not read this article and give yourself 1,000 lashes for thinking impure thoughts about being unduly influenced by your exposure to sponsors. Shame! Shame! As some of you may remember last year I drove the Rotek Racing TTRS to 4th place in the Time Attack 1 division and an outright Front Wheel Drive record at the Pikes Peak International Hill Climb, one of the oldest, sketchiest, most revered races in America. It was my first time racing up Pikes in anger and even with all my years of experience behind the wheel of a race car, the hill still threw things at me that I had never encountered before and never expected. The thin air at the 10,000-foot altitude at the start robbed my car of almost 40 percent of its power. (Yes, it’s turbocharged, but even turbos run out of breath at that altitude.) Worse still, the TT was geared for the high speeds of the Nürburgring where it normally races not the hairpins that litter the face of Pikes Peak. As good as the TT was, with all those unforeseen challenges, we knew that the car wasn’t working at its most optimal out in Colorado. The plan for 2017 was to come back with the same TTRS but fully dialed for Pikes Peak with more power, better gearing, more downforce and a driver with a year’s experience under his belt. As you can guess from the title of this article, those plans went straight out the window. My team (Rotek Racing) had put the TT up for sale almost a year ago. Despite a very reasonable price tag, it’d had almost no bites until not more than a day after I had signed a title sponsor for this year’s event. The phone rang with a call from a fellow team owner and good friend with cash in hand who wanted to buy the car. Damn. Alright, what now? The first thing to do (after running around in a blind panic) was calmly and rationally decide a course of action. The sponsorship deal meant that I was locked in to the event, so I needed a new race car. Ready-to-race Pikes Peak vehicles aren’t particularly easy to find at your local used car lot, so I had to find a street car with enough base performance to turn into a competitive race car. Also, I only had 90 days to make that happen. Fortunately for me, my good buddy Dario Arnautovich owns Urban Motors, a used car dealership in Denver, CO that specializes in branded title (salvage) cars. I had salvage title cars on my mind for ever since I got Dario to take me to the massive Manheim Denver auction a few months back for shits and giggles. (Not my giggles. I don’t giggle.) I had never been to the a car auction before and I wanted to see what went on there. I was blown away by how cool it was. Cars were going through the auction lines almost faster than I could keep up. I could barely understand the half dozen or more real live auctioneers spit-firing descriptions of cars and sales prices. I knew that a car auction where I had my best shot at finding the right car for my mad automotive science experiment. Getting to select your weapon of choice for a one off race is a rare opportunity, so you can’t waste it. You need pick an ideal car based on exactly what type of challenges that race presents. With the Pikes Peak Hill Climb there are more than a few. Easy upgrades. Remember this one. It’ll make an appearance again later. Breaking things down to that level made it easy to put together a short list of eligible cars. Conveniently, I’ve favorably reviewed three of these cars for Jalopnik in the not to distant past. Clearly I have no problem in putting my money where my mouth is. • Porsches are always quick up the hill. • Active suspension and a high-revving motor. • Turbo engine and great handling. Would I have loved to run a McLaren P1 or a Ferrari FXXK? Sure! Sadly, the chances of seeing one of them cross the auction block somewhere in Colorado is somewhere between slim and none.... at least not at the auctions they let me into. With this realistic shopping list in hand, Dario and I set out to scour the internet in search of the perfect donor car. And we found it. CoPart is one of the largest of the salvage title car auction sites. I log in from time to time to dream the dream, but usually the cars I see are fully Humpty Dumptied. Nobody is putting them back together again. Recently, though, on CoParts “Featured” page, we spotted a suspiciously clean looking 2017 Corvette Z06. 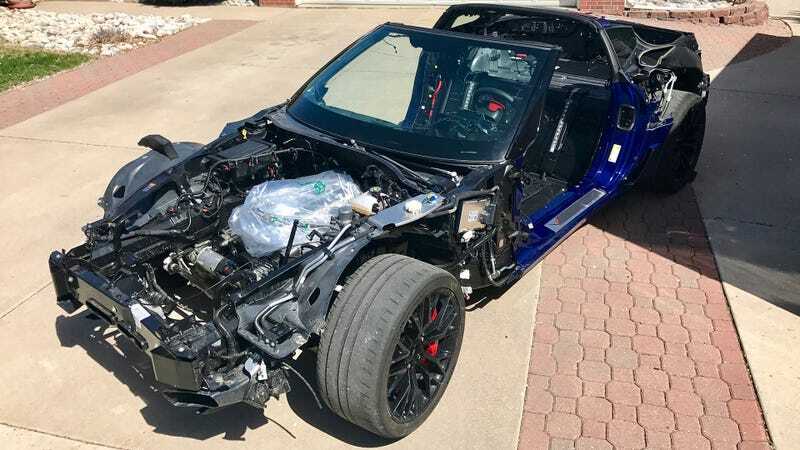 I say suspiciously because one very common trick that the auctions guys do is to take a car that has been badly damaged, then reinstall all of its body panels in a way that it looks far less beat up then it really is. Most of these cars get sold over the internet, so it’s often tough to get a good read on how bad the car is damaged short of paying a few hundred dollars to get someone local to go inspect it. What tipped the scales for me on this blue Z06 was the odometer reading: nine miles. No, I didn’t forget any zeros. Now it was time to do a bit of sleuthing. We (okay, Dario) did a VIN search and found out that the car came from a dealer in Washington state and it only had a Bill of Sale. This would normally be a concern if you were trying to get it titled for use on the street, but since this was going to be a race car the title didn’t matter so much. Dario called over to the dealer and found out that the lot tech assigned to drive the car from its warehouse to the showroom floor decided that he wanted to see what the car could do. He ended up doing his best impression of a Mustang leaving a Cars and Coffee and stuck it into a ditch. It wasn’t long before I became the proud owner of a nine-mile 2017 Corvette Z06 for way less than half of the cost of a new car. This was the most insane salvage car purchase ever. Or was it? I still hadn’t seen the car in person. I knew it ran on the lot, but nothing beyond that. I could have the automotive version of a five figure paperweight for all I knew. The nerves I had when the transport company rolled up to Urban Motors went way quickly once we had the car unloaded. The interior plastic wrap was still on the seats and none of the dealer-installed spoilers, wings and associated doodads were even mounted. This was literally the newest car I have ever owned. The first thing we did was stick it on a lift where we saw some evidence of the accident, but it was all very superficial. A bent cross brace, a damaged lower transmission cooler, some scrapes to the underbody and the aforementioned blown airbag was it. Somewhere between $2 and maybe $3,000 dollars would have this ‘Vette back up to brand new condition in no time. The proof of the screaming deal I scored came a few days later at our local track, High Plains Raceway, coincidentally during our local Chevrolet dealer’s open track day there. Their sister store Emich VW had been one of my sponsors for several years and they were kind enough to invite me out and let me loose with my new purchase. As always, these projects are possible by knowing the right people and maintaining good sponsor relationships. My first laps in the car confirmed it: The Z06 is a beast. Straight out of the (slightly damaged) box, this car is one of the fastest, most capable street cars I have ever driven. I was easily running sub-two-minute laps around a track that only sees those kind of times with track-prepped race cars. I could go on and on about how good the street car is, but why? The day after we left the track the car was on the lift again. This time it went to NRG Motorsports, the shop owned by my 2016 PPIHC car chief and noted Corvette expert Alex Nelsen, being stripped bare to prepare it for roll cage installation. Now we’re in the process of turning this Z06 into a Pikes Peak challenger. We started with no more than 90 days to make that happen, so we’re bring in some Corvette tuning experts to help us make the car safer, lighter, more powerful, more aerodynamic and better-handling in time for this year’s race. The fun thing about race cars is they don’t need to follow all the same rules as their street-legal cousins. That and having access to all of the tools and equipment of a full race shop should make this otherwise-overlooked salvage title car build possible. Now we get to see if we can make it from the bottom of a ditch to the top of the Peak.